Price is per 16-inch string - each bead measure 10mm x 5mm.Beautiful shine! 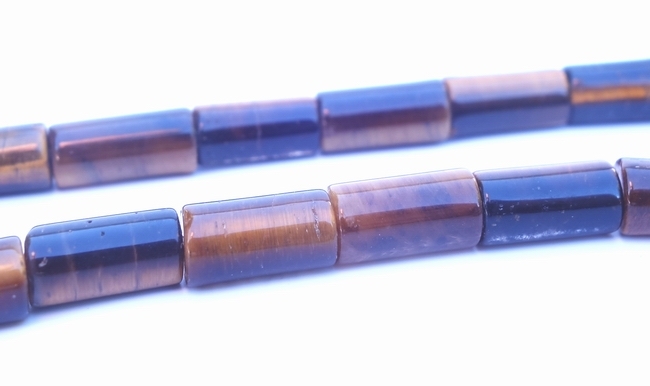 Tigers-Eye is good for those worried about health. It builds will-power and inner-strength, and has traditionally been used to heal wounds, eyes, and the lower legs and feet. Its also said to bring spiritual well-being and psychic protection, as well as attracting beauty and abundance. Similar stones are cats-eye and hawks-eye. All with bands of pearly luminescence creating a supernatural appearance. Cats-eye can be yellowish-brown to green with a white band, and is said to bring wealth and pleasure from your children. Hawks-eye has a blue radiance. When a bright light source is directed at the side of the stone, one side of the eye will be milky white and the other remains colored. When the stone is rotated, the colors switch.